Robert Mueller is seeking an interview with White House chief of staff Reince Priebus. 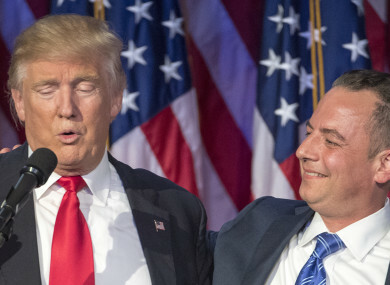 File photo of Trump with Priebus during the 2016 presidential election. US SPECIAL PROSECUTOR Robert Mueller is seeking an interview with ousted White House chief of staff Reince Priebus as he expands his probe of Russian interference in the November election, The New York Times reported today. Mueller wants to question current and former senior officials in President Donald Trump’s administration about his move to fire FBI director James Comey, in an attempt to determine whether the US leader obstructed justice, the newspaper said, citing people briefed on the matter. In a sign that Mueller’s investigation may be intensifying, he ordered FBI agents last month to raid the home of former Trump campaign manager Paul Manafort. A grand jury is reported to have been impaneled in Washington to look at evidence, and the White House has been asked for documents related to former national security adviser Michael Flynn, who was fired shortly after taking office for his undisclosed Russia contacts. But Rod Rosenstein, the deputy attorney general who appointed Mueller to lead the Russia probe, warned a week ago that he would need clearance from above before expanding his investigation beyond its original scope. The Times said Comey met Priebus at the White House on 8 February, a week before the ex-FBI chief said Trump pressured him to end a probe into Flynn. Comey told Priebus that a Justice Department policy bars discussions between the FBI and White House officials about ongoing investigations in order to prevent political meddling, a law enforcement official told the Times. Manafort was forced to resign a year ago amid reports he was under investigation over millions of dollars he was allegedly paid by the pro-Russia former Ukrainian president Viktor Yanukovych. Manafort’s private consulting business on behalf of Moscow-linked billionaire oligarchs has fueled concerns about possible collusion, and also questions about how he handled payments for his services. He also took part in a June 2016 meeting between Trump campaign officials, including son Donald Trump Jr. and son-in-law Jared Kushner, and a Kremlin-connected Russian lawyer on the promise of damaging information about Trump’s election rival Hillary Clinton. While the White House has downplayed the meeting as insignificant and said nothing came of it, critics said it indicated the campaign’s willingness to consider cooperating with Russia. Read: What would happen if North Korea actually did fire missiles at the US territory of Guam? Email “Special prosecutor looking to interview Trump's ex-chief of staff over Russia election interference ”. Feedback on “Special prosecutor looking to interview Trump's ex-chief of staff over Russia election interference ”.